This post is part of our ongoing series exploring classic experiments and theories in the history of psychological research. Over the last few decades, an ongoing debate has emerged between parents, psychologists, and the media: Do violent video games and movies cause children to become more violent? This is a question that has gained more urgency with the advent of hyper-realistic violence in games and movies, and it is a question that gets revisited every time a new shooting tragedy occurs. Many may remember the Columbine High School shooting in April 1999 as the first instance of a nationwide, intense scrutiny of popular portrayals of violence, even in stylized video games, as potential influences on children and adolescents. However, concerns about how observation of violence might shape children’s behavior a generation earlier had already led to a classic study with telling results. Beginning in 1961, Albert Bandura of Stanford University conducted a series of studies with the goal of examining imitative violence in children between the ages of 2 and 5 years old. These studies are commonly known as the “Bobo doll studies,” because the hapless victim of aggression was an inflatable clown doll named Bobo, who had a weighted bottom that allowed him to stand up straight after being kicked, punched, or pushed to the ground. Bandura’s team brought children into the laboratory and showed them examples of model aggressors performing violent acts on the Bobo doll – for example, hitting, kicking, pummeling, pushing, and throwing him. A control group of children saw models that did not behave violently to Bobo. For some children, the models seen were live actors; for some, the models were videos of human actors; and for some, the models were cartoon-like videos with an actor in a cat costume (Bandura, 1963). Each child only saw one type of model. 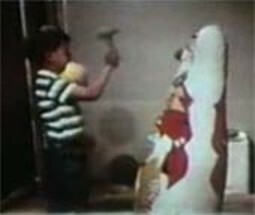 After each child watched the model interact with the Bobo doll for several minutes, they were taken down the hall by an experimenter and brought to a room full of appealing toys. However, as part of the study, the experimenter told the child that he or she could not play with those toys, and that they would have to go to a different room. This was intended to mildly frustrate the child. Lastly, the child was brought to a playroom including the Bobo doll with which they had seen the model interact. The playroom also included “aggressive” toys (including dart guns and peg-and-mallet pounding boards) and “non-aggressive” toys (including a tea party set, dolls, and crayons). Researchers counted the number of aggressive activities performed by each child, and then analyzed the data to determine whether there was a relationship between the type of model the child had seen and the number of aggressive acts that child performed. Results of these studies showed that children who had viewed live-action aggression, realistic video aggression, or even cartoon aggression were more likely to act in aggressive ways toward the Bobo doll than were children in the control group, who had not seen models of aggression. Interestingly, the children’s acts of aggression were not limited to imitations of the models, although imitations of the particular aggressive behaviors they had seen were common. Children also developed their own aggressive acts toward the Bobo doll, sometimes incorporating other toys found in the room, such as the dart gun. Aggression toward other toys besides the Bobo doll was also observed. Surprisingly, having watched the cartoon video model led to child rates of aggression almost as high as the rates for the live-action model. Although rates of imitation behaviors were higher for the live-action model, there was no difference in total aggression between children in the live, realistic, and cartoon model conditions. 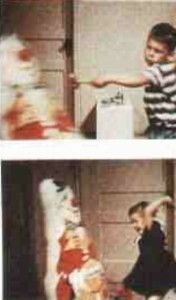 So what are the parallels between questions about violence in media today, and a 1963 study using an inflatable doll? At first glance, it may seem that these findings are outdated – technology-wise, we’ve come a long way in the last 50 years, and we’ve seen the advent of first-person shooter games, movie CGI, and detailed graphics. However, these findings are still extremely relevant. For one thing, they show us that even young children will imitate what they’ve seen, regardless of whether the video they’re watching seems realistic to adults. In terms of children’s reactions, cartoon violence was just as powerful as realistic violence. For another thing, these findings show that increases in aggression after watching videos of aggression aren’t limited to simple imitation. A typical argument against the idea that violent cartoons or media may lead to violent behaviors is something like the following: “If that were true, every kid would go around shooting other people/ stealing cars/ dropping large anvils onto people’s heads.” But these children didn’t only replicate what they saw the model do. Instead, children actually “owned” the aggression by creating new interpretations and acts, suggesting that while exposure to violent cartoons, films, or video games certainly doesn’t always lead to an exact replication of the circumstances portrayed, it still has the potential to increase a child’s aggression in general.. There have been many follow-up studies since the original Bobo doll studies, and certainly, violence in child-targeted media receives more attention today than it did 50 years ago. However, this classic study should remind us that it is not necessarily a child’s potential for imitation of the newest first-person shooter, set of slick graphics, or edgy action film that should cause concern. What's more important is the finding that even basic exposure to aggression, regardless of realism, may increase the probability of generalized aggression in children.